← Get your Bling on… in the Bathroom… with a Painted Sink! Hello blog readers. This elegant powder room features our Scented Garden design painted on a Kohler drop-in sink and toilet. It’s a classy two-room set-up with the sink and toilet in a separate room. These are customer photos so I didn’t see the house, but I would think it’s a pretty nice one, judging by this luxury powder room! 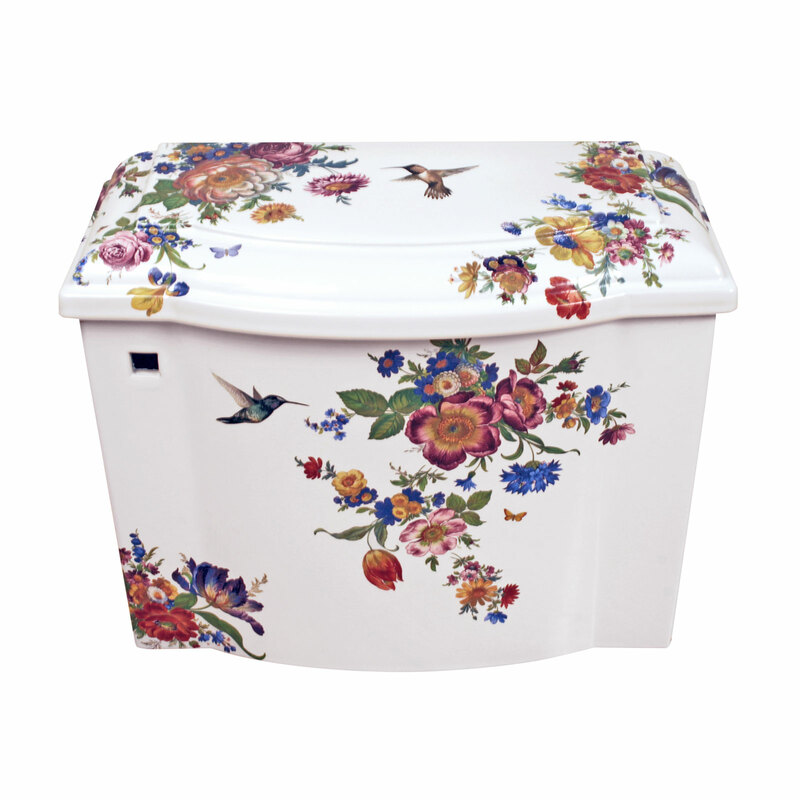 These is just one design in our collection of decorated and hand painted sinks, toilets and bathroom fixtures. All made by hand by me in (way too hot right now) Henderson, Nevada. I’m a one man band at decorated bathroom LLC. I do it all!. Tiredly. It’s noon on a Sunday, I’m trying to blitz out a bunch of blog posts. 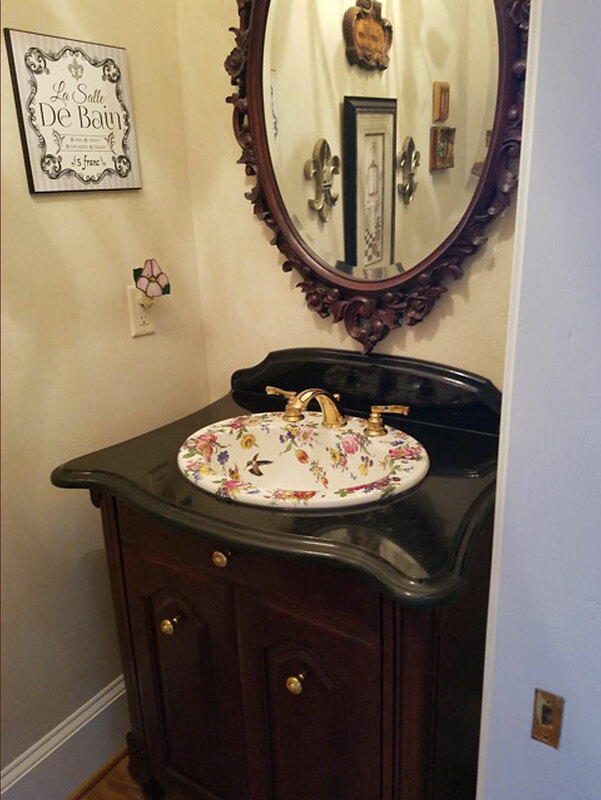 Scented Garden floral painted sink installed in the powder room. Kohler Pennington painted with the Scented Garden floral design on the sink. Here’s a close-up of the sink showing all the flowers and colors in the design. The basin is a Kohler Pennington Drop-in porcelain bathroom sink. We take the sink, apply the design to it and kiln-fire to about 1500 degrees to permanently fuse the design to the glaze on the sink. It won’t wear out or fade away. The floral design painted on the sink features flowers including roses, tulips, poppies, daisies, morning glory, violets, chrysanthemums, iris and cornflowers. It’s accented with two hummingbirds, a butterfly and a ladybug too. 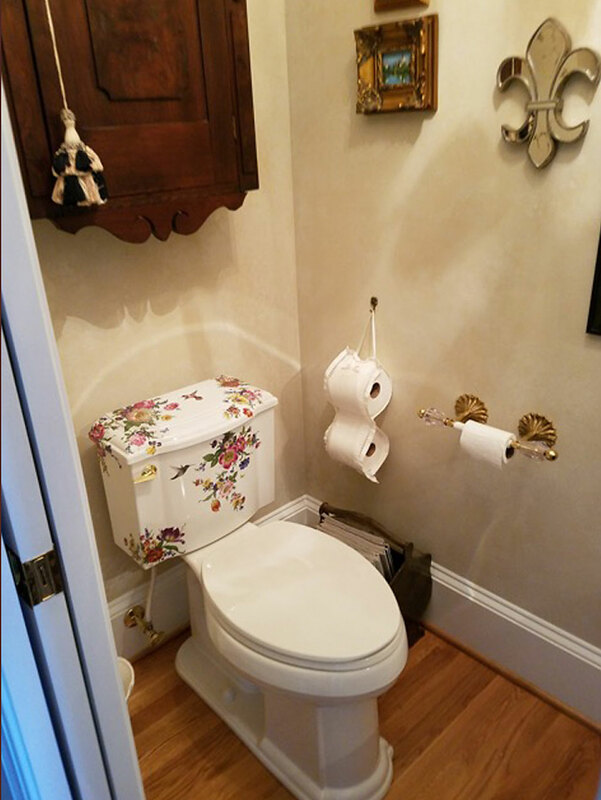 This elegant powder room features the Scented Garden floral design painted on the toilet. The bathroom has a separate room for the toilet, I love that, gorgeous high baseboards and a lovely wooden floor. The antique cabinet over the toilet provides some storage, and it’s got a beautiful toilet paper dispenser in gold with crystal accents. I see they also upgraded the flush handle on the toilet to gold, nice touch. They come in chrome, and the cost of a gold handle is outrageous, practically the cost of the toilet tank itself, with no decoration on it of course. Even a gold plumbing connection on the wall… classy! They were very nice customers too. Heres a close-up of the flower design painted on a Kohler Devonshire toilet. The toilet the design is painted on is a Kohler Devonshire. The design on the toilet features the same flowers, two hummingbirds and a pair of butterflies. The Devonshire toilet has a nice curved area on the front, the perfect spot to display the flowers and design and the big rolled edge on the rim with the ridges adds some extra style. 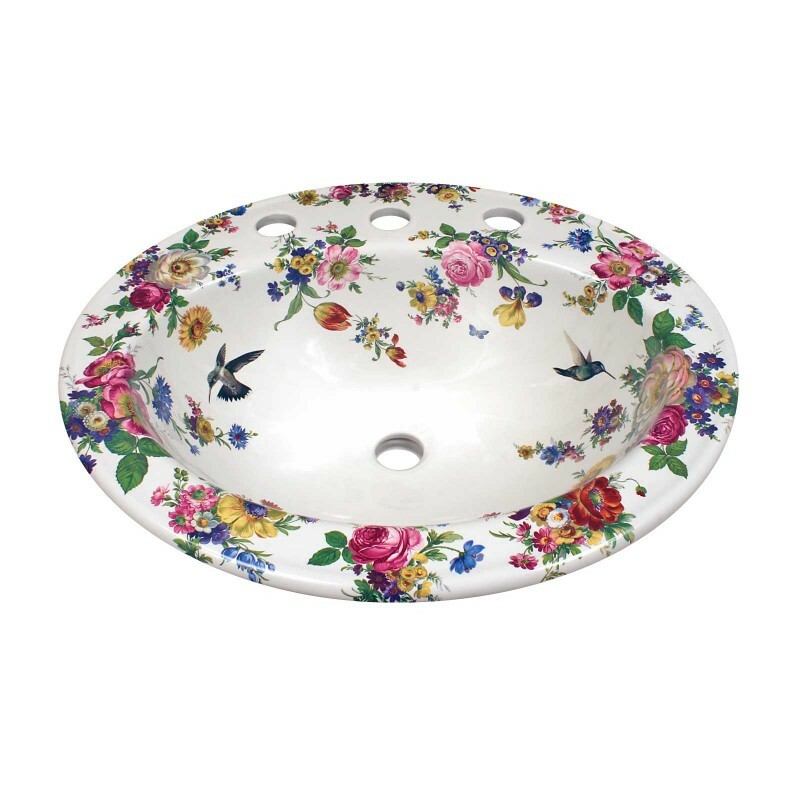 Customers love our Scented Garden designs when they are looking for a traditionally-styled painted sink. I’ve put it on everything from pedestal lavatories, vessel basins, vases and accessories, and many more. You can check out a previous post Scented Garden Mural on a bathroom where I did a tile mural and accessories only. Please check out our complete collection of hand painted sinks, toilets, tiles and accessories, all made by me, by hand in the USA by Lynne, on our website decorated bathroom.